Pilgrims are the perfect Thanksgiving table decor. 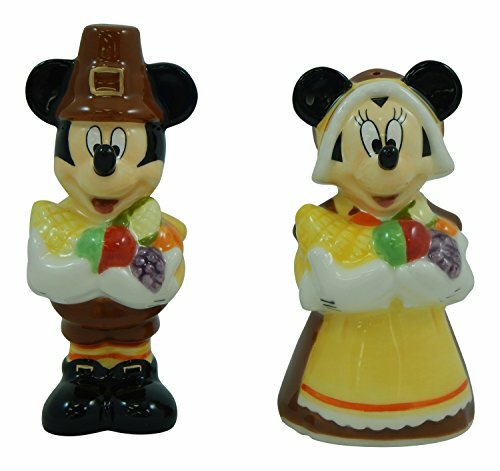 Here's a wonderful variety of Pilgrim salt and pepper shakers. Thanksgiving dinner and all the trimmings usually includes a festive array of harvest decorations. But it's also a time to remember those who celebrated the first Thanksgiving at Plimoth Plantation. So it's not unusual to see a smattering of Pilgrim salt and pepper shakers or a pair of Pilgrim candle holders on the table. Now I do live in New England, but I bet this tradition is a national thing as well. All of the Pilgrim salt and pepper shakers seen here are for sale on ebay or Amazon today. You'll find a great selection of vintage, plastic, and interesting Pilgrim salt and pepper shakers. 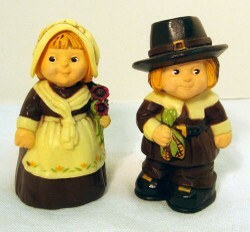 This romantic Pilgrim couple measures about 4 inches tall. Perfect for your Thanksgiving or Autumn table. Fall weddings are far more popular now, so this is also a wonderful wedding shower gift. If you're visiting friends to see some fall leaves, this is a great host gift. We've got a huge family and there is no way that we all fit around one table. So there is the traditional kids' or cousins' table were most of the little ones and a few grown ups sit each year. Quite frankly as the youngest of six, I'm still waiting to be promoted to the grown-up table. Somehow, even when I host the Thanksgiving dinner, I end up with the little kids. So I know how it is and I always make sure that that table is extra special. But let's face it, kids will be kids and things do get broken. So I've discovered plastic everything. 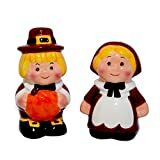 I found lots of adorable plastic pilgrim salt and pepper shakers. They are so reasonably priced that I bought a bunch and every few seats gets a different one. None of them are the same. It makes an easy and cheap table decoration. It's also fun to not that not all Pilgrims are people. They are often teddy bears or turkeys. The teddy bear Pilgrim salt and pepper shakers are really perfect for the kids' table. Thanksgiving is definitely a time of remembering all of the wonderful family dinners that we shared with our families. So it can be a bittersweet time as we remember those who aren't with us anymore. I have mostly older brothers and their wives weren't really interested in receiving any family keepsakes as my great aunts passed away. Well, that made me the lucky one who got to have anything I wanted. I admit that I'm so sentimental that I took just about everything that was offered. So as I unpack all of the vintage Thanksgiving decorations that I inherited I do remember all of those people. Invariably the same stories get told by my mother and father - and that's okay. As us kids start to have kids of our own, it's important that they know who came before them in our family. So they know who owned the Turkey Pilgrim Salt and Pepper Shakers or the Teddy Bears. I can't help but wonder who the sentimental ones are in that generation that I'll eventually give them to. I don't think that I'll wait as long as my aunts did. As they set up their own households, I'll invite them over and let them take some stuff. It's an economical way to set up a household. More importantly it's a great way to add lots of memories and history from the start. If you weren't lucky enough to receive family keepsake Pilgrim salt and pepper shakers, you can easily find a great variety on ebay. There are hundreds for you to choose from. Yes hundreds of Pilgrim salt and pepper sets. Try finding that many anywhere else. If you've never bought anything from an ebay seller before, don't worry it's easy and secure. Just remember there have to be a lot of reasons that ebay is one of the most popular online shopping destinations. Most sellers include lots of pictures of items large and small. So it's easy to understand what you're buying. But if you do have questions then by all means use the email address provided to contact the seller and ask. Remember to do this before you even place a bid. Just use your common sense and pretty soon you'll have a tabled filled with wonderful Thanksgiving table accents. Get inspired for your next Thanksgiving celebration by checking out the Youtube Video below. Did you know that you can actually eat Thanksgiving dinner at Plimouth Plantation. It's a very festive time and you'll learn a lot about that first Thanksgiving. I'm sure there are lots of Thanksgiving items for our tables. It's fun to mix them into your tableware. These are really cute. Are there other bowls or stuff that can go along with these? Create a timeless Holiday table decor with these vintage Santa salt and pepper shakers.